I love quiche. When I was diagnosed with Type 2 diabetes in 2005, one of the things I missed was eating pie crust. Over the years I learned to do without the pie crusts. I stumbled across a blog post about quiche and saw this idea for Spinach Artichoke Dip and thought to try and make a quiche. This recipe reminds me of the Greek dish Spanakopita pie made with Phyllo dough. The filling is awesome, I thought. Hope you enjoy the recipe. Preheat oven to 350 degrees. Lightly grease a 9” pie plate with butter or olive oil, your choice. In a large bowl, combine all the ingredients except for the Parmesan cheese and mix well. Pour the egg mixture into the greased pie plate. Sprinkle the Parmesan cheese on top. Bake for 45 minutes or until the center is set. 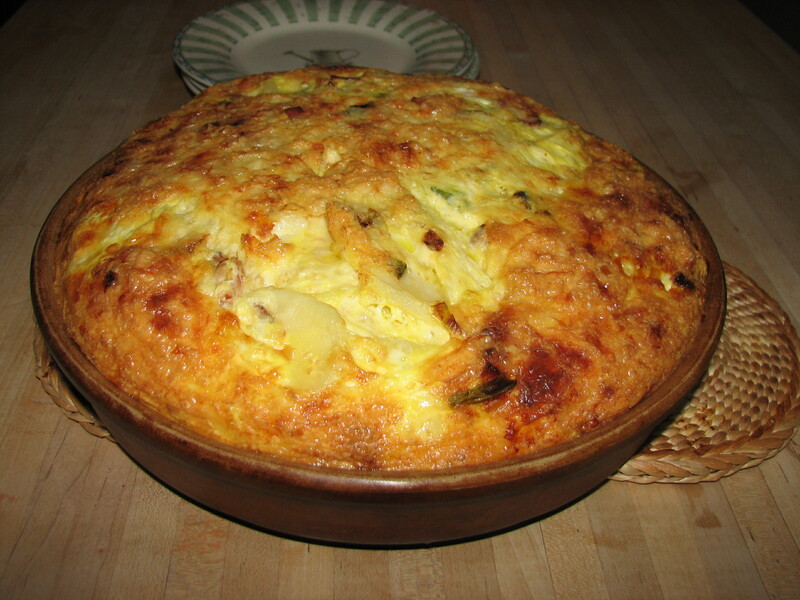 Test the quiche by inserting a butter knife in the center and it comes out clean. Note: if not want a lot of spinach in the quiche, can do 6-8 oz. instead of the whole box. I made this for a friend who is vegetarian and part of a birthday dinner. I saw this recipe years ago but I cannot remember where. This is a great recipe because low-fat ingredients were used and there is no pie crust. Works great for those who are really counting their carbs and is very diabetic friendly. This quiche is absolutely delicious and for those of you watching the waistline – Weight Watcher points is only a big whopping 3 points! For a nice change, you can substitute 5 cups of fresh spinach for the broccoli. Pre-heat oven to 350 degrees. I used my deep dish stoneware (you can use a glass pie plate lightly wiped down with olive oil). Heat oil in large saute pan over medium high heat, add onion garlic and cook for 1-1/2 minutes stirring often. Add broccoli, and saute until broccoli is heated through. Spread evenly in pie plate. Combine milk, cheese, mustard, egg whites, eggs, salt, pepper and nutmeg in large bowl. Pour over broccoli mixture in pie pan; and sprinkle with Parmesan cheese. Bake for 40 minutes or until top is golden and knife inserted in center comes out clean. Let stand 5 minutes before serving. I was thumbing through an old Taste of Home Cookbook and came across this recipe. I tried it exactly the way the recipe was written with bacon and pie crust. The dish was very good but not as healthy as I would have liked it. I am a huge fan of potatoes, bacon and pie crust but pie crust has a lot of carbohydrates for me and bacon is wonderful but fatty. I need to watch my sugar levels because they are constantly spiking and I felt the recipe needed some major tweaking. Here is my healthier version and I think it actually tastes better. The dish freezes really well for those breakfasts or dinners that you can just defrost the food, heat it up and serve. Breakfast you can serve this with fresh berry salad or for dinner with a healthy green salad. Enjoy! Preheat oven to 350 degrees. Spray a 10” glass pie dish or a deep dish stoneware pie dish lightly with olive oil. Steam the potato rounds for about 4 to 6 minutes until medium tender. Transfer the potato rounds to a cooling rack. Once cool, line the pie dish with potato rounds to cover overlapping a little bit. If you have extra potatoes left you can use it for breakfast or lunch with little bit of your favorite cheese melted on the left-over potatoes. Heat olive oil in a medium sauté pan; add the chopped green onions, thyme, and Canadian bacon and sauté for about 5 minutes until heated through. Spoon the mixture over the pie rounds. Sprinkle the grated smoked cheddar cheese on the bacon onion mixture and then pour the egg product on top. I used about 1-1/2 containers. Bake quiche until center is set about 35 minutes. Cool 10 minutes. Cut into wedges and serve warm with either with fresh berries or a fresh green salad. Note: The recipe called for 8 eggs, but since I am watching and tweaking recipes to have a healthier dish, I changed it the eggs to a product that is similar to Egg Beaters – but cheaper at Trader Joe’s called “Egg Product”. One container is almost the same as 7 eggs. I used 2 containers. What I love about this product is that is no cholesterol or fat and it is really good. If you want to use eggs, then whisk 8 eggs in a bowl with pepper and mix the cheese in the egg mixture, instead of how it is explained in the directions above.